As you age, your skin builds up layers of dead cells, leading to uneven skin texture and a dull complexion. Microdermabrasion is an exfoliation treatment that removes the top cell layer of skin. It gently and safely smooths skin irregularities and lightens discoloration to reveal a more radiant, softer, younger- looking skin. Treatment is affordable and convenient, with no downtime and minimal recovery. There is no peeling, sloughing or bleeding. The skin is left looking only slightly red, like a wind-burn for 1-2 days. Complications are extremely rare. If you are looking for the best Microdermabrasion San Diego, you have come to the right place! We use the Dermasweep, a crystal free machine thus avoiding any possible risks associated with the crystals. Because microdermabrasion is gentle and gradual, multiple treatments are needed to achieve the desired results. For optimal results, we recommend a series of 6-12 treatments per area. More may be necessary for some conditions. Results are cumulative and should be spaced 3-4 weeks apart. Areas that can be treated include: Face, neck, chest, hands, and arms. One microdermabrasion treatment takes about 30 to 40 minutes. 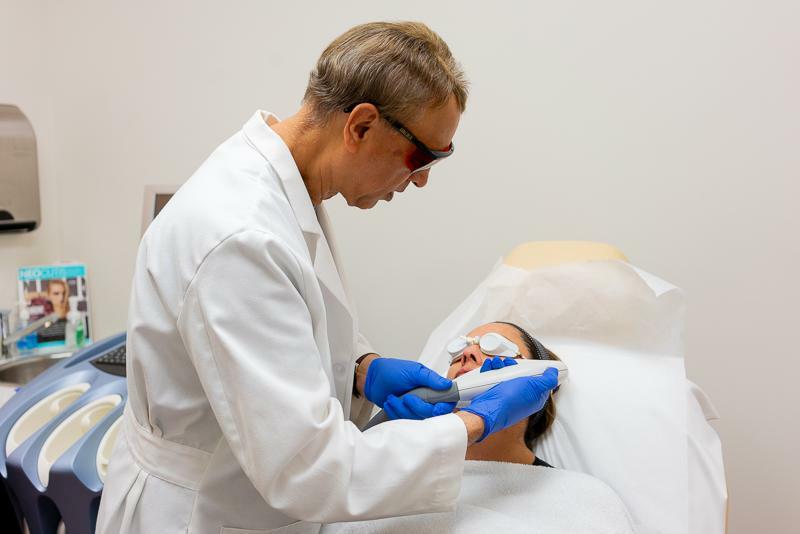 Prior to getting microdermabrasion San Diego, patients are encouraged to follow a good skin care routine and apply sunscreen daily. Our skin care professionals will apply a special lotion to your face after treatment and recommend a suitable moisturizer (skin Medica) for everyday use. You can apply make-up immediately after the procedure. However, expect the skin to appear flushed for up to 48 hours after treatment. It is important to continue to apply sunscreen daily as skin is more fragile and prone to sunburn. For two days following each treatment, we advise patients to avoid products with ingredients known to irritate skin (e.g., Retin-A, retinol or alpha hydroxyacid). — get the best hydration of moisturizers inside the epidermis. Hyaluronic Acid solution for dehydrated skin. Dr. Mann usually pre-treats these patients with Retinol and Hydroquinone first. Patients love this hydrated, supple soft, moist feeling of their skin after one of these treatments – no wonder it is the most popular treatment at our clinic. For a facial rejuvenation please call our clinic now for an appointment.